I’ve always wanted to make the perfect pesto. 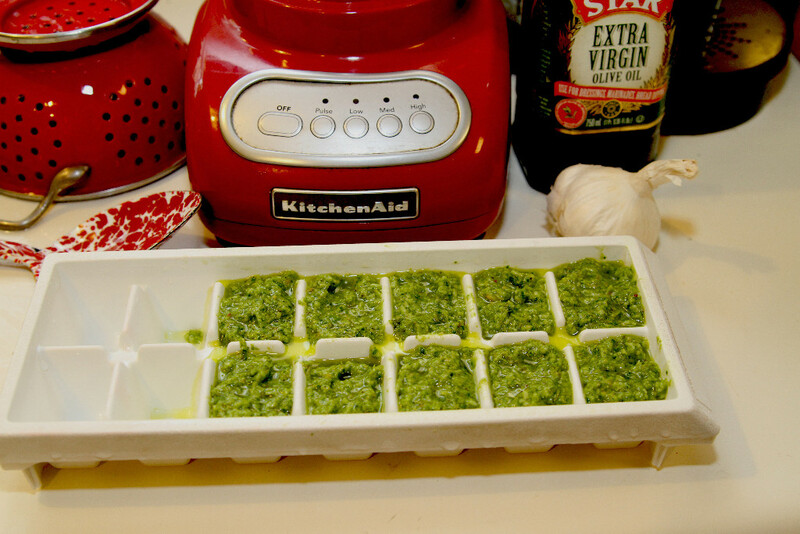 Not too much garlic, a soft basil flavor, nice consistency….you know, perfect! My former high school student, now friend, Leigh and I were having coffee recently and the discussion turned to pesto. 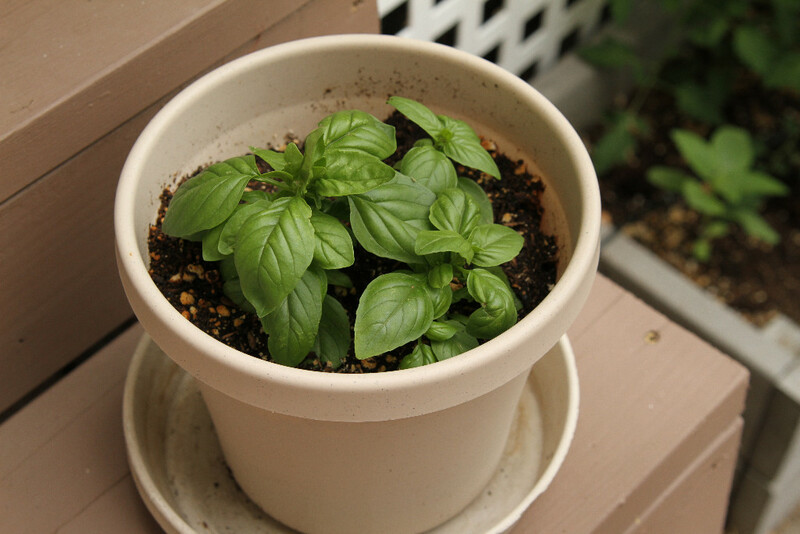 Which she loves to make…with her own basil…her own way. Yep, I need a lesson from her! Today we had our lesson and it was so good I have to share! But first let me tell how it went on my own! I started some basil from seed, (Italian Cameo, a container sized basil from Renee’s Garden Seeds) and it was growing well, so last week I tried making pesto on my own. Enter Leigh! 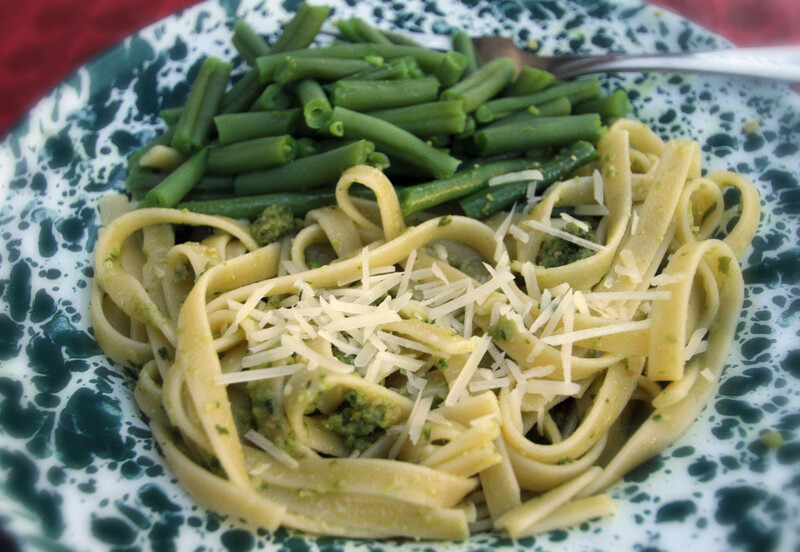 She explained adding the cheese to your dish after making the pesto works better…and it did. 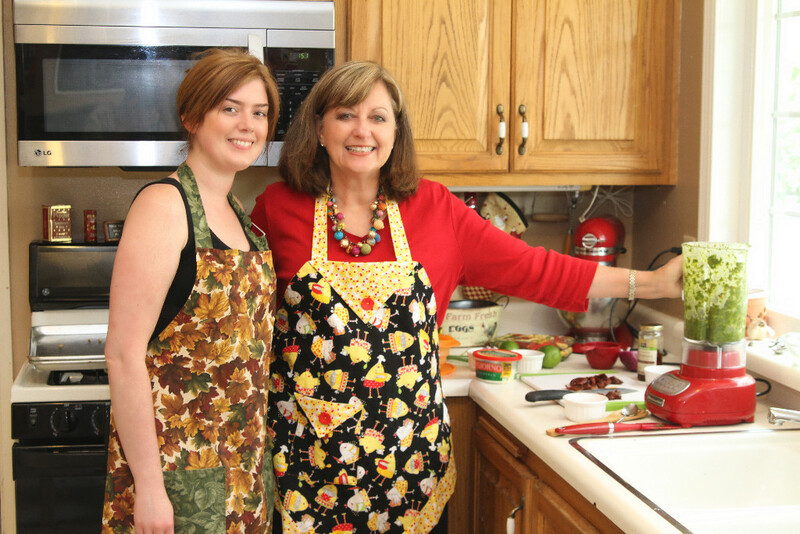 She started with a cook book recipe from a while ago and adapted it to her own liking (and mine!). She also stressed the importance of gathering all your ingredients in small dishes, measuring each one and then adding them carefully. After mixing all but the oil in the blender a bit, she had me slowly pour the oil through the opening in the top of the blender….wow, what a difference! 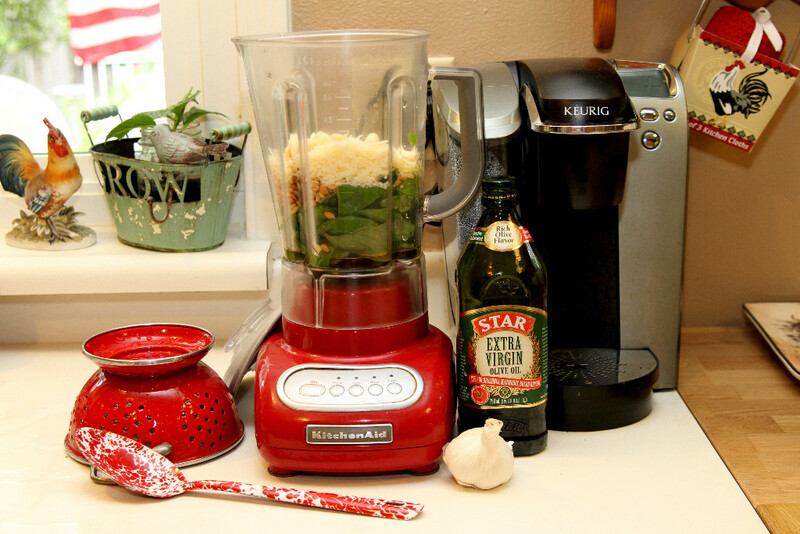 Instead of a clumpy mess we had ….real pesto! The taste was great but we determined we wanted it a little “thinner” so we slowly added 1/4 cup more oil and it was perfect! I mean really scrumptious and bright green and beautiful too! She used almonds and pine nuts and I loved the blend. Now we could have stopped there and dumped it on pasta like I did but she had a better idea…a really delicious idea! She had me fix bowls of fresh artisan lettuce, then mix the pesto with the shredded white meat of one cooked chicken (I had been “baking” it in the crock pot for 5 hours), some cherry tomatoes, chopped sun dried tomatoes, chopped red onion to taste and a few green onions, sliced. 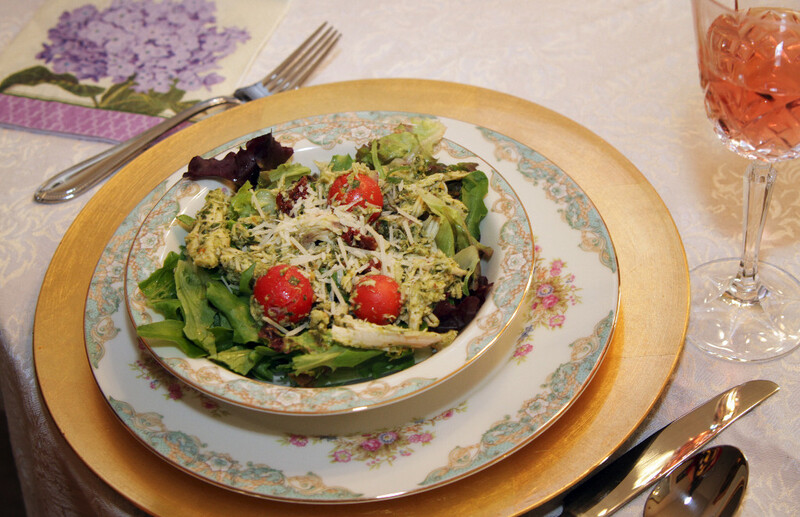 This wonderful chicken mixture was heaped on our bowls of lettuce and sprinkled with shredded Parmesan cheese. Oh man….I just can’t describe how good it was! Toast nuts about 8 mins. in 350 oven. 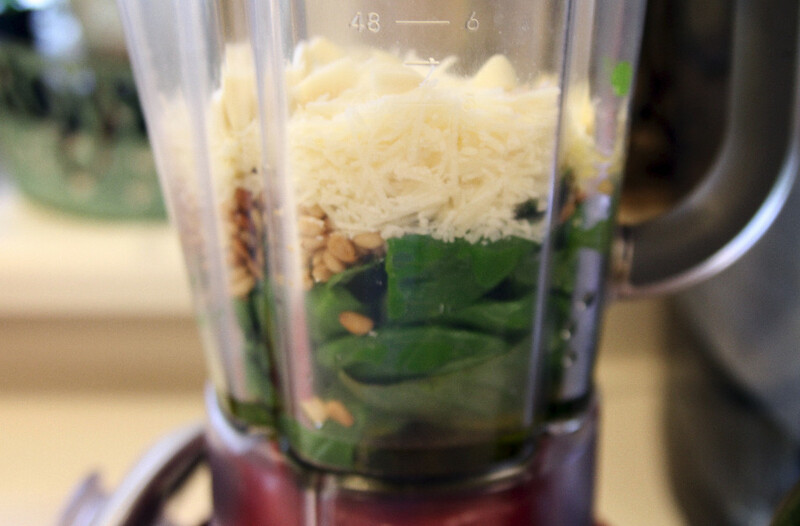 Combine nuts, basil, garlic, salt in food processor or blender. Blend slightly then process while you add the oil in a slow, steady stream. Add the lime juice and combine until desired consistency. (Don’t over mix and end up with puree). Mix all the pesto with the shredded breast meat of one cooked whole chicken. Add cherry tomatoes, chopped green onion, chopped red onion, sliced sun dried tomatoes in oil, to taste. Layer the chicken mix on the lettuce and sprinkle with shredded Parmesan. Makes 4 generous servings or 6 side salads. Enjoy!